Islam is a monotheistic religion based upon the teachings of Muhammad, a 7th century Arab religious and political figure. It is the second-largest religion in the world today, with an estimated 1.4 billion adherents, known as Muslims. Muslims believe that God revealed his final message to humanity through Muhammad ibn Abdullah (c. 570 - July 6, 632) via the angel Gabriel on numerous occasions between the years 610 and his death on July 6, 632. Muhammad is considered to have been God's final prophet, the "Seal of the Prophets". The revelations Muhammad preached form the holy book of Islam, the Qur'an. The Qur'an is believed to be the flawless final revelation of God to humanity, valid until the day of the Resurrection. Islam says all Muslims are equal before God, and all Muslims belong to one community, regardless of ethnic or national background. Islam was founded by the prophet Mohammed, who Muslims believe was the last and most important in a series of prophets, including Abraham, Moses and Jesus. The Muslim scripture is the Holy Qur'an (Koran)which means "the timeless words of God." It has 114 chapters and comprises the main teachings of Islam. Islamic law forbids the artistic representation of God, the prophets and -- sometimes -- of human beings in general. Islam (a word that literally means "surrender to the will of God") arose in Arabia with what Muslims believe are a series of revelations to the Prophet Mohammed from the one and only God, the God of Abraham and of Jesus. These revelations, conveyed by the angel Gabriel, are recorded in the Qur'an. Muslims believe that these revelations, given to the greatest and last of a chain of prophets stretching from Abraham through Jesus, complete God's message to humanity. The Hadith, which recount Mohammed's sayings and deeds as recorded by his contemporaries, are another fundamental source. A third key element is the Sharia, the code of law derived from the Qur'an and the Hadith. Belief in one God, Allah in Arabic, constitutes the very foundation of Islam. There is no deity except Allah. He is indivisible and absolutely transcendent. God is the Almighty, the Creator and the Sustainer of the universe, Who is similar to nothing and nothing is comparable to Him. Worship and obedience belongs to Allah and Allah alone. Joining other gods with God is an unforgivable sin. Any one who joins other gods with God has strayed far, far away from the Truth. 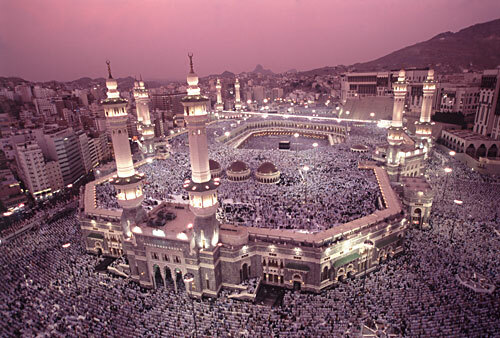 Prophet Muhammad was born in Mecca(Makkah), a city in the present-day Saudi Arabia in 570 C.E. He is a direct descendant of Prophet Ishmael, the first son of Prophet Abraham. Peace and blessings of God be on all His prophets. Muhammad received divine revelations (The Holy Quran) over a period of 23 years in the seventh century of the Christian Era. Muslims believe that he is the last Messenger sent by God for the guidance of mankind until the Day of Judgment. The primary sources of knowledge are the Holy Quran and the Sunnah of the Prophet Muhammad. Anyone wanting to live a life in worship and obedience to God should follow these teachings. The Holy Quran (also written as Koran) is the Divine Book revealed to Muhammad . The Holy Quran confirms what was revealed to earlier messengers of God and serves as the Criterion of right and wrong. The Quran is the only divine Book extant in its original text and is therefore the only source of Guidance from God for all mankind. The Sunnah of the Prophet Muhammad refers to his sayings and actions, his approvals and disapprovals. The Sunnah is collected in books separate from the Holy Quran and are known as Hadith books. While the Holy Quran is 100% word of God revealed to the Prophet, not every Hadith is authentic. Early Muslim scholars have classified hadith into various categories ranging from different levels of authenticity to false hadith. The Sunni are the largest group in Islam. In Arabic, as-Sunnah literally means "principle" or "path." The sunnah, or example of Muhammad is described as a main pillar of Sunni doctrine, with the place of hadith having been argued by scholars as part of the sunnah. Sunnis recognize four major legal traditions, or madhhabs: Maliki, Shafi'i, Hanafi, and Hanbali. All four accept the validity of the others and a Muslim might choose any one that he/she finds agreeable to his/her ideas. There are also several orthodox theological or philosophical traditions. The more recent Salafi movement among Sunnis, adherents of which often refuse to categorize themselves under any single legal tradition, sees itself as restorationist and claims to derive its teachings from the original sources of Islam. Shi'a Muslims, the second-largest branch of Islam, differ from the Sunni in rejecting the authority of the first three caliphs. They honor different accounts of Muhammad (hadith) and have their own legal traditions. The concept of Imamah, or leadership, plays a central role in Shi'a doctrine. Shi'a Muslims hold that leadership should not be passed down through a system such as the caliphate, but rather, descendants of Muhammad should be given this right as Imams. Furthermore, they believe that the first Imam, Ali ibn Abu Talib, was explicitly appointed by Muhammad to be his successor. Sufism is a mystical form of Islam followed by some Muslims within both the Sunni and Shi'a sects. Sufis generally believe that following Islamic law is only the first step on the path to perfect submission; they focus on the internal or more spiritual aspects of Islam, such as perfecting one's faith and subduing one's own ego. Most Sufi orders, or tariqas, can be classified as either Sunni or Shi'a. However, there are some that are not easily categorized as either Sunni or Shi'a, such as the Bektashi. Sufis are found throughout the Islamic world, from Senegal to Indonesia. Their innovative beliefs and actions often come under criticism from Salafis, who consider certain practices to be against the letter of Islamic law. About 2 million Muslims from more than 70 countries journey to the holy city of Mecca each year to make the spiritual pilgrimage known as the Hajj. The pilgrimage is one of five Pillars of Islam that form the framework of Islamic life. All Muslims who are physically and financially able are expected to perform the Hajj at least once. The Hajj begins on the eighth day of Dhul-Hijjah (month for Hajj), the 12th month of the Islamic year, and lasts for as long as six days. A few miles outside Mecca, there is a cutoff referred to as the "Christian bypass". ... If you remain on the main highway, there is a police checkpoint just after the exit, where non-Muslims are kept out of the holy city. Entrance to Mecca itself is forbidden to non-Muslims, and the entire city is considered a holy site to Islam. While in Mecca for the Hajj, male pilgrims are required to dress only in an Ihram, a garment consisting of two sheets of white unhemmed cloth, the top draped over the torso and the bottom secured by a white sash; plus a pair of sandals. The ihram is intended to show the equality of all pilgrims in the eyes of Allah, symbolizing the idea that there is no difference between a prince and a pauper when everyone is dressed equally. The Ihram also symbolizes purity and absolution of sins. This also portrays simplicity. Many female pilgrims traditionally wear a simple white or black dress with a head covering. A place designated for changing into Ihram is called a miqat. While the pilgrim is wearing the Ihram, he cannot shave, cut his nails, or wear jewellery. An invocation known as the talbiyah should be chanted as the pilgrim is donning the garment. a tawaf, which consists of walking around the Kaaba three times at a hurried pace, followed by four times, more closely, at a leisurely pace, in a counter-clockwise direction. the sa`i, walking seven times back and forth between the hills of Safa and Marwah now enclosed in the Masjid al-Haram. This is a re-enactment of Hagar's frantic search for water, before the Zamzam Well was revealed to her by an angel sent by Allah. These rituals comprise the Umrah, sometimes called the lesser Hajj. The Umrah can be taken at any time throughout the year and although completing it is highly commendable, Muslims are still required to perform the greater Hajj, during the appointed time. Despite not being part of the ritual, most pilgrims drink water from the Zamzam Well when the Umrah is completed. Also, men and women trim off approximately one inch of hair. At this point, the pilgrim can change from the ihram to regular clothes. This release from ihram is known as the mut'ah of Hajj. The greater Hajj (al-hajj al-akbar) begins on the eighth day of the month of Dhu al-Hijjah. Pilgrims again put on ihram. They leave Mecca for the nearby town of Mina, where they spend the rest of the day. The next morning, on the ninth of Dhu al-Hijjah, the pilgrims leave Mina for Mount Arafat. They must spend the afternoon within a defined area on the plain of Arafat until after sunset. No specific rituals or prayers are required during the stay at Arafat,but is said that all prays will be answered, called the wuquf, although many pilgrims spend the time praying, talking to God, and thinking about the course of their lives. After sunset they leave for Muzdalifah, an area between Arafat and Mina, where pebbles are gathered for the stoning of the jamarat. Having spent the night in Muzdalifah, the pilgrims now go back to Mina. It is now the 10th of the month, the day of Eid ul-Adha. As the first part of the stoning of the jamarat ritual, pilgrims throw seven pebbles at the large jamrah (wall) in Mina. After this, an animal is sacrificed. Traditionally the pilgrim killed the animal himself or oversaw the killing. Today many pilgrims buy a sacrifice voucher in Mecca before the greater Hajj begins; this allows an animal to be slaughtered in their name on the 10th without the pilgrim being physically present. On this day pilgrims are released from most ihram restrictions; they have their heads shaved and change out of the ihram garment. The head shaving is a symbol of rebirth, signifying that the pilgrim's sins have been cleansed by completion of the Hajj. On this or the following day the pilgrims visit the Masjid al-Haram in Mecca for a tawaf called the Tawaf az-Ziyarah (or Tawaf al-Ifadah) which is an obligatory part of the Hajj. The night of the 10th is spent back at Mina. Finally, before leaving Mecca, pilgrims perform a farewell tawaf called the Tawaf al-Wada. The core purpose of the Hajj is not to look out on the wonders of the Kaaba and the beautiful mosque, but to look within -- to discover oneself. The Kaaba is the shrine that Muslims turn to five times each day when praying. During the Hajj, pilgrims circle the Kaaba seven times. The Kaaba is located inside the mosque known as al-Masjid al-Haram in Mecca. 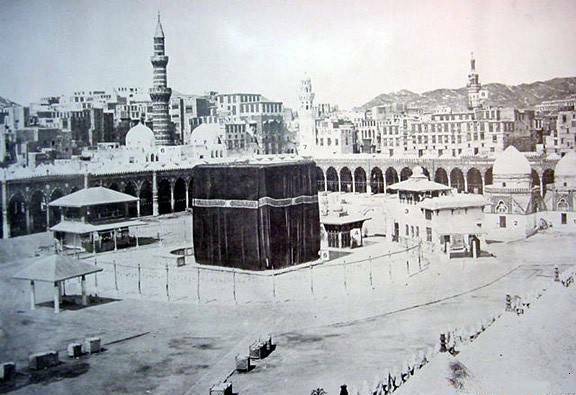 The mosque was built around the original Kaaba. 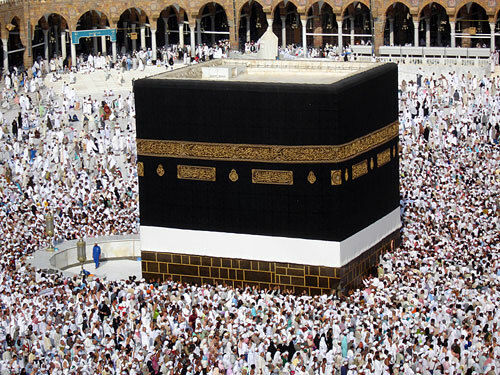 The Kaaba is a large masonry structure roughly the shape of a cube. (The name Kaaba comes from the Arabic word "muka'ab" meaning "cube"). It is made of granite from the hills near Makkah, and stands upon a ten inch marble base, which projects outwards about .3 metres (1'). The most reliable approximations for the structural dimensions are: 15 metres (49') high, with sides measuring 10.5 metres (34') by 12 metres (39'). The four corners of the Kaaba roughly face the four points of the compass. [In the eastern corner of the Kaaba is the "Rukn-al-Aswad" (the Black Stone or al-Hajaru l-Aswad), generally thought to be a meteorite remnant; at the northern corner lies the "Rukn-al-Iraqi" ('The Iraqi corner'); at the west lies "Rukn-al-Shami" ('The Levantine corner') and at the south "Rukn-al-Yamani" ('The Yemeni corner'). It is covered by a black silk curtain decorated with gold-embroidered calligraphy. This cloth is known as the kiswah; it is replaced yearly. The Shahada is outlined in the weave of the fabric. About two-thirds of the way up runs a gold embroidered band covered with Qur'anic text. Entrance to the inside of the Kaaba is gained through a door set 7 feet above the ground on the north-eastern wall of the Kaaba, which acts as the façade. It is accessed by a wooden staircase on wheels, usually stored between the arch-shaped gate of Banu Shaybah and the well of Zamzam. Inside the Kaaba, there is a marble floor. The interior walls are clad with marble half-way to the roof; tablets with Qur'anic inscriptions are inset in the marble. The top part of the walls is covered with a green cloth decorated with gold embroidered Qur'anic verses. The building is believed to be otherwise empty. Adhan - The call to prayer. Ahmad - Another name for Muhammad. Allah - The Arabic word for "god." It is often used as a name for God in Islam. Badr - The place of the first significant battle between and the pagans of the Quraish. It is located in Saudi Arabia. Caliph - A Muslim ruler. Dawah - The proliferation of Islamic teachings through word and deed. Din - Obedience to the revelation of Allah's Qur'an (Koran). It involves total submission. Fatwa - Legal verdict given based on the Qur'an (Koran) and the Sunnah which are the recorded sayings and deeds of Muhammad. Hadith - The sayings and deeds of the prophet Muhammad recorded by his followers. Considered authoritative and perfect. A saying is called a Sunnah. Hajar - The Black Stone set into the corner of the Ka'aba in Mecca. Tradition states it fell from heaven. Hajj - The pilgrimage to Mecca which takes place in the last month of the Islamic calendar. One of the five pillars of Islam. Hawijah - The sixth level of hell which is the place for Christians. Hegirah - Muhammad's immigration to Medina. It begins the Muslim calendar. Hijrah - Moving from a land where a Muslim cannot practice his faith to a land where he can. Ibadah - All the words and deeds with which Allah is pleased. These deeds could be prayer and charity. Iblis - Satan, a fallen Jinn. Imam - The political head of an Islamic state. Injil - The inspired sayings of Jesus. The message of Jesus. Islam - Submission, the religion of all the prophets of Allah culminating in Muhammad. Jannah - The heavenly garden, Paradise. The place of the faithful in the afterlife. Jihad - Striving. Fighting against one's own sinful self. Also, a physical fight for the truth of Islam, not allowing anyone to steal the ability to worship. It also can mean "holy war." Jinn - Supernatural, invisible beings race of beings, below angels. They were made from fire and are capable of looking like humans or animals. Some may dwell in rocks, trees, etc, and may possess black dogs, and black cats. There are good and bad Jinn and all will be judged on Judgment Day. Ka'aba - A cube shaped building in Mecca containing a stone laid there by Abraham and Ishmael. All Muslims face this cube when praying. Koran - Also spelled Qur'an. The holy book of Islam given to Muhammad by Allah through the Archangel Gabriel. Koran literally means "the recital." It is the final revelation of Allah given to the prophet Muhammad. It has 114 surahs, or chapters. Khutbah - A sermon given in a Mosque, usually on Friday. Masjid - A center for Muslim activity. It is like a local mosque. Mecca - The Holy City of Islam. It is the birthplace of Muhammad. Medina - The city, then called Yathrib, that Muhammad fled to after announcing Islam. Mosque - A Muslim house of worship. Muhajir - Immigrant, one who leaves his home town to join a Muslim community. Muhammad - the final messenger/prophet of God whose message abrogated all previous revelations. He received the Koran through the angel Gabriel over a 23 year period. Muhammad ibn Abd Allah - the full name of Muhammad. Muslim - Someone who holds to the religion of Islam. Nas - The multitude of people who are not dedicated to Allah and sway to and fro to various teachings. Nasara - A word used in the Koran to designate those who are Christians. P.B.U.H. - A shortened designation for "Peace be upon him" which is placed in writing or said after the word "Muhammad" is used. Paradise - Another word for heaven. A garden (79:41) of bliss and fruit (69:21-24), has rivers (3:198), with maidens pure and holy (4:57), and carpets and cushions, (88:8-16). It is the hope of all Muslims. Qadar - Preordainment is the teaching that all things, good and bad, are preordained to occur. Qibla - The direction which Muslims turn for daily prayers, towards Mecca. Quraish - An ancient Arab tribe to which Muhammad once belonged. Rakat (rak'ah) - One complete cycle of sacred words and gestures during the ritual prayer. Ramadhan - The ninth month of the Islamic calendar which is the month of the fast. Shi'ites - A sect of Islam that teaches that leaders should be political rulers. Shirk - Associating another god with Allah. Associating anything with Allah that is not true and revealed in the Koran. Sufi - A sect of Islam. It is very mystical and teaches strong self denial with the hope of union with God. Sunnah - The life, practices, and sayings of Muhammad recorded as examples of perfect conduct in society, religion, action, etc. They contain the Hadith. Surah - A chapter of the Koran. Taghut - Everything that is worshipped or followed other than Allah. Taiyib - Pure, clean, wholesome. Taqwah - Proper fear and veneration of Allah. A divine spark that enables the person to understand God. Tauhid - Monotheism in Islam is the teaching that there is only one God who alone is worthy of worship. Tauhid-ar-Rububiyah - Declaring that God is one, the sovereign who performs all his will. Tauhid-al-Uluhiyah - Declaring that God is the only one worthy of worship. Ummah - A religious community, usually referring to an Islamic one. Umrah - A Minor form of pilgrimage to Mecca. Wa Alaikum Assalam - The Arabic way of saying "peace be upon him." Zakat - The third pillar of Islam. Alms giving, charity that is given to the poor. Zinah - Fornication and adultery.